The team finished second in the Faculty of Business round of FLUX but stepped up for the title, and was made up of Ella Thorpe, Sam Castlehouse, Thomas Faulkner, Adam Price, Vicky Broom and Jacob Cunningham. Students have put a vital fundraiser a step closer to reality after planning it as part of a tricky annual business challenge. 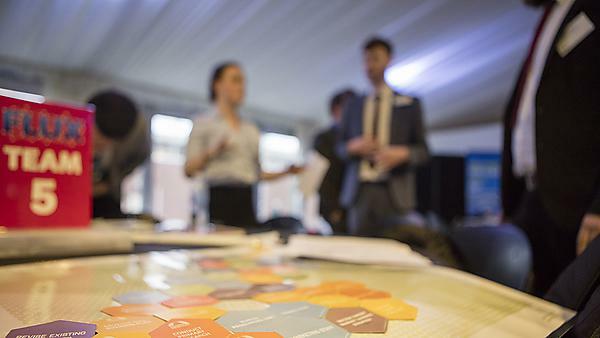 Six teams from the University of Plymouth battled it out in the final of the University’s annual FLUX competition, with local charity St Luke’s Hospice Plymouth setting the real-life scenario of planning a Kite Flying Festival. From budgeting to location, six teams of six students discussed, planned and presented potential ways to run the event, which the charity hopes to launch in summer 2018. And after deliberations from St Luke’s and experts from a range of local employers, Magnum Opus – a team of law students from the Faculty of Business – were named the competition winners and University FLUX champions for 2017. FLUX is a fast-paced business challenge, where an employer sets a real business challenge for six-strong teams of commercial students to resolve. This year’s final saw six teams – three from the Faculty of Science and Engineering and three from the Faculty of Business – give it their all for the title. Magnum Opus, who finished second in the Faculty of Business round of FLUX but stepped up for the title, was made up of Ella Thorpe, Sam Castlehouse, Thomas Faulkner, Adam Price, Vicky Broom and Jacob Cunningham. “As a local charity, we need to raise over £4 million every year to continue providing end of life care for over 3000 people and their families in our community. We are always looking for that next big thing in fundraising. Generating new and creative fundraising activities that engage with our supporters is an essential part of what we do. Great fundraising concepts will ensure a sustainable income and ultimately fund the delivery of the specialist care we provide. By helping our students and graduates find work and internships, we’re supporting local businesses and helping to inject new talent and fresh ideas into the economy. Shirley Walker, Head of Careers & Employability.